I have wanted sunshine columbines (Aquilegia x caerulea) in my garden ever since I first saw them in a gardening catalog, but I have had unexpected problems with this supposedly easy to grow perennial. Two springs ago I bought four packages of sunshine columbine seeds. That spring I planted seeds inside under grow lights, and in early summer I planted more outside in the garden. Germination both times was less than impressive. I had the same discouraging results with more of that same purchased seed this past spring… from the fifty or more seeds I planted over these two years, only two seeds actually germinated… inside under the grow lights that first spring. This spring these two surviving sunshine columbines didn’t look as healthy or as vigorous as my alpine columbines or even the wild red columbines, but I was pleased to see that they were at least alive. 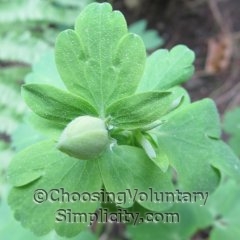 Soon both plants were covered with fat yellowish white flower buds. By the time the flowers were fully opened, their petals were a beautiful bright sunshiny yellow. 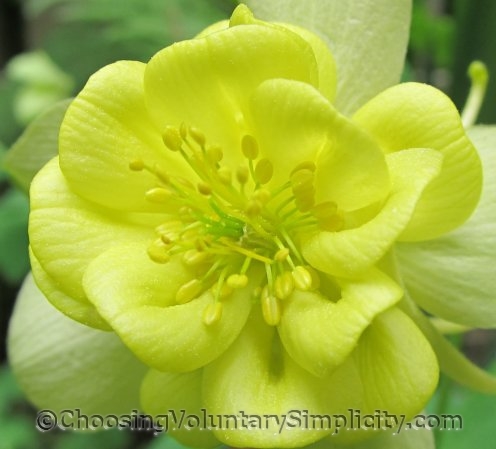 Sunshine columbines bloom in late spring to mid summer, and the flowers have very long spurs. The pale green dense foliage should eventually form a clump at least two feet tall and more than a foot wide. The seed packet says that this columbine is supposed to live for approximately five years, readily self seeds, and blooms the first year. I have read that it can also be propagated by division. It is hardy to zone three. I’ve had wonderful results with all the other columbines I have planted or grown, so I’m thinking probably the main problem with these is the seeds I bought. I think I need to look for a different seed source… or just wait until the two small columbines I have now manage to produce some seeds. I was hoping they would this year, but the seed pods that formed did not mature. Is It So Small a Thing? 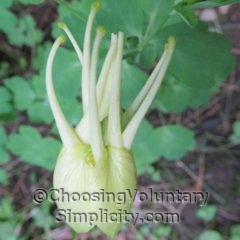 I haven’t found the sunshine columbine to be easy to grow either. You’re ahead of me if you have living plants. I have gone through 3 packets of seeds, that’s 60 seeds, and I still haven’t had any success. I hope you’ll update on this plant next spring. Oh – this is such a lovely flower!! I’m partial to that yellow. Love it! Shirley, don’t give up. Once established, this columbine *is* easy to grow, but I also had a difficult time getting the seeds to germinate and the seedlings to live. I have read similar comments on other sites from other people so perhaps it isn’t as easy a plant to grow as one particular seed company advertises. Sure is pretty though, and well worth the extra trouble. This is new to me this year and so far it is doing well. I’m glad I started with a plant and didn’t try seeds. I was a little disappointed in the number of flowers but hopefully once it matures there will be more. The color is striking, don’t you think?